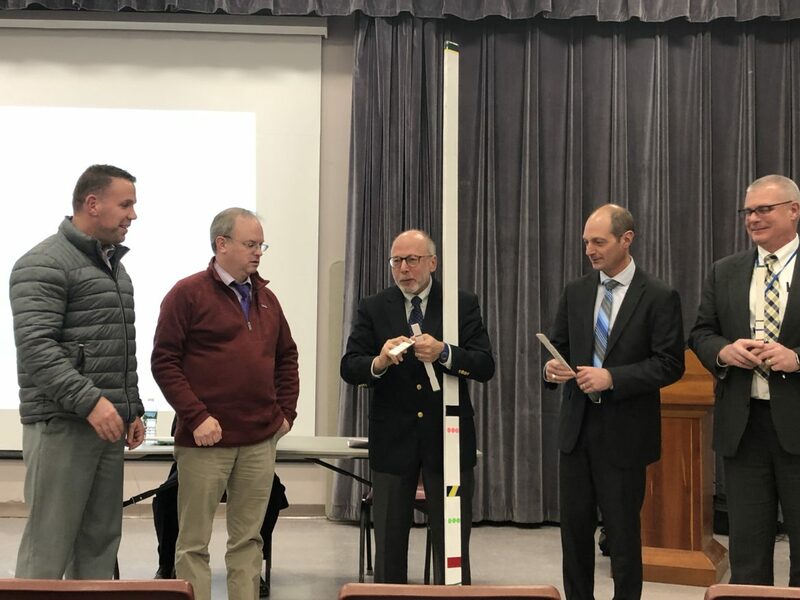 Andru Volinsky (center) gives replicas of his property value inequity stick to four school district superintendents from central New Hampshire. From left to right are Mark MacLean of Merrimack Valley School District, Brendan Minnihan of the Laconia School District, Michael Tursi of the Shaker Regional School District and Kirk Beitler of the Gilford School District. 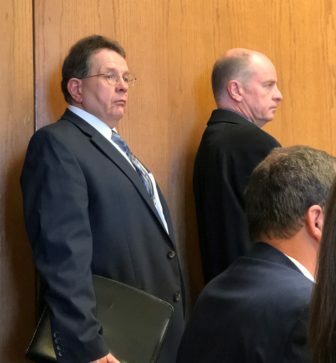 CONCORD – There is no foreign language teacher at Pittsfield High School, according to the district’s superintendent, Dr. John Freeman, who testified at a legislative hearing on Thursday. Instead, students who want to learn a foreign language listen to a Rosetta Stone language program while a paraprofessional supervises. There are no Advanced Placement or computer technology instructors, either. In Berlin, the district will be forced to close Brown Elementary School, City Councilor Denise Morgan Allain confirmed Friday night. And in Newport, the district is facing an additional loss of $194,000 in 2019-2020, which could push the tax rate up an additional $1.50 per thousand when the town has capped the increase at 44 cents. With two reductions-in-force since 2005 that cost 30 positions, failed teacher contracts and no easy access to special education outplacement services, Newport Superintendent Cindy Gallagher told the House Education Committee on Thursday that without a moratorium on the cuts to stabilization funds, there is nothing more she can do to provide a state-mandated level of education to her students. “I don’t have a whole lot left,” Gallagher said. Gallagher, Berlin Mayor Paul Grenier and Dr. Freeman were three of the education and civic leaders who testified at a House Education Committee public hearing in favor of House Bill 177, which would stop the four-percent annual decrease in stabilization money that goes to individual school districts. Stabilization grants began in fiscal 2012 after a legislative change eliminated fiscal capacity disparity aid. Beginning in 2012, each district received 100 percent of the amount of funding under the old formula, but it has by statute been declining by four-percent each year since fiscal 2017. The goal was to phase out the grants in 25 years, in theory, leaving individual school districts time to develop a way to locally fund their school districts. But the system has failed the communities whose equalized property value are on the lower end of the scale, says District 2 Executive Councilor Andru Volinsky and John Tobin, Jr. They are two of the attorneys who represented five property poor school districts in the NH Supreme Court cases in 1993 and 1997 known as Claremont 1 and Claremont II. The court ruled the state had a constitutional duty to fund an “adequate” education for all of its students and the taxes it raises must be distributed uniformly throughout the state. Seventy-three percent of the cost of a public education in New Hampshire comes from local property taxes. The two components are the school tax and the state-wide property tax, the second of which is determined by the state, but collected and distributed by individual communities and redistributed to their respective school districts. Volinsky and Tobin said this ranks the state 50th in the nation in the amount of education costs that must be raised through local taxation. For the communities whose properties are at the low end of the value spectrum like Newport, Berlin, and Pittsfield, this means local property taxpayers shoulder a disproportionate amount compared to those in property wealthy communities like Moultonborough and Portsmouth. Grenier told the committee Thursday that 68-percent of the property in the city of Berlin is tax exempt because it is state prison property, church owned, or part of the White Mountain National Forest. “How can you support an education funding process that creates the inequality of property wealthy towns and cities against the property poor communities that have no potential for expansion of taxable properties?” he asked during his testimony. “I’m tired of getting the legs kicked out from under me,” Grenier said. According to data crunched by Volinsky and Tobin, Berlin property owners pay $39.52 per $1,000 for taxes and spend $16,680 per pupil, which is just over the state average of $15,865; $19.18 is for the schools. The equalized value, which is defined as the total taxable property value divided by the number of students of Berlin’s property is $326,000. The equalized value of taxable property in Portsmouth is $2,630,000, or eight times that of Berlin. The school tax rate is $6.68 per $1,000 and the city spends an average of $18,346 on each student. “These kids compete against each other (for higher education opportunities and employment),” said Volinsky, in one of his statewide speaking engagements in Belmont Thursday night where he and Tobin explained school funding to local residents. Volinsky carries a big stick with lines drawn on it at various heights representing the equalized property values of some of the wealthiest towns at the top and some of the poorest ones at the bottom. Average value communities like Laconia are in the center. As an aside during his Belmont presentation, he said the stick is not tall enough to include Moultonborough, whose school tax rate is $4.07 based on $6,731,000 in equalized value. As to arguments made in the past that New Hampshire has a “conservative” system of education funding, Volinsky said it is “arbitrary” and “arbitrary” is not legal in light of the Claremont ruling or with the New Hampshire Constitution. Tobin told the crowd that the property wealthy communities have one of four things – a lake, a mountain, a seacoast or direct access to a state highway interchange. He said one person in a Newport session bemoaned the fact that a meteor that created Lake Sunapee landed where it did instead of a few miles away in Newport. Volinsky said that 77 percent of the state’s students live in communities that have equalized assessment values below the state average of $1.043 million. Eleven of the state’s 13 cities are represented in that 77 percent and include 133 communities. “Somehow the wealthy towns convinced the government that the poor kids were in the minority,” he said. Saying they preferred a legislative solution rather than another protracted lawsuit, Volinsky and Tobin encouraged residents in the poorer property communities to pressure their elected representatives, who regardless of party affiliation, can pressure colleagues into an equitable solution. As to HB 177, the House Education Committee has just begun the process of evaluating whether to place a moratorium on the reduction in stabilization funding.